Both of us are big on Christmas. Mary likes the shopping, baking, and interior decorating, and Greg always wanted a big outdoors Christmas displays. 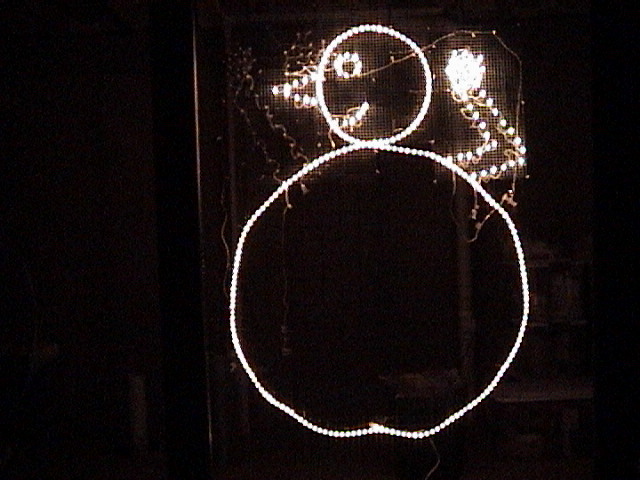 Once we purchased our first house in 2001, Greg got a chance to work on that display and experimented with animated displays that are controlled by a computer. That year Greg built two parallel port controls that could control 8 circuits each. These were simple to build and control, but didn't provide much growth potential. For 2002, Greg started in January trying to find a design that would allow us to control many more circuits without purchasing expensive Digital I/O Boards that were used by a few others around the United States. After a bit a searching, he found Hill Robertson's design for a 320 circuit device that could be controlled by a parallel port and spent much of the year building our own version At the time, the device was rather amazing and allowed for up to 320 AC circuits to be switched on and off using a single Parallel port on a PC..
CoolDisplays.Net Trying to locate impressive holiday displays near you? CoolDisplays.Net is a great tool for locating holiday displays across the United States. DoItYourselfChristmas.com This has become our defacto source for keeping up with others who do Computer Controlled Christmas light displays. The formus on this site are a great resource for learning about the hobby. These are other community based websites with good information for those interested in different aspects of Computer Controlled Christmas displays. Light-O-Rama Really interested in creating your own animated displays but don't have the technical know-how? If so, then check out these vendors. These sites offers both the hardware and software you need to control your lights and set them to music. There are many other vendors in the space, that have better prices, but these are the two vendors we have primarly leveraged in the past. Planet Christmas The original home of computer controlled Christmas lights! The site isn't as popular as it once was, but Chuck Smith was the father of Computer Controlled Christmas lights and and was a key driver in this becoming so popular. The odd looking object on the right has been passed through the Hormann family for generations. Now matter which direction you look at it from, you can always see a 5 point star! Made entirely of copper and colored glass, this one of a kind decoration weighs a ton. 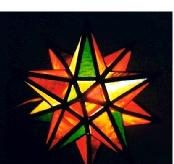 The Star was designed and built by my great-great uncle and given to my grandfather to be hung outside their Fort Wayne home where it was placed every Christmas for many years. Upon his passing, the Star was given to my father who presented it to me in 1998. My grandparents always hung the Star outside on the porch until the year it disappeared while my grandparents were attending church. After placing articles in the local paper explaining the family significance of the star, it mysteriously reappeared a few days later. Since that incident, the Star is now proudly displayed every Thanksgiving through New Years in our front window. See the following links for all of the different displays we've done.